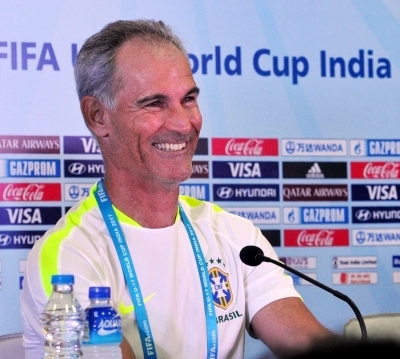 Kolkata, Oct 27 (IANS) Brazil coach Carlos Amadeu is disappointed that they are not in the final of the FIFA U-17 World Cup, but feels the fact that they are getting to play seven games at a youth event augurs well for the development of their footballers. Three-time champions Brazil will take on last-year’s runners up Mali in a third place playoff clash on Saturday ahead of the all-important final between England and Spain. The Selecao boys, who were tipped as one of the favourites to win the tournament owing to some of the individual brilliance of their players, failed to get past England in the semi-final. Amadeu’s charges lost 3-1. “We cannot forget that we are playing for the development of these players. We played 7 games. Yes we wanted to play the final but it is better than playing just 5. We have to represent our county and that is what we are going to do tomorrow,” Amadeu told reporters on the eve of their third place tie at the Vivekananda Yuba Bharati Krirangan here. “The level of this competition was high. Many teams could have won. Mali, Ghana from Africa… France, Germany, Spain and England from Europe and Brazil an Paraguay from South America. “Mexico could have done better. The level did not look like it was an U-17 tournament and it was really high quality of football. These seven matches gave us a lot of experience,” Amadeu added. Brazil players like Alan and Paulinho were seeing distraught on the pitch after their loss to England in the last-four stage. Asked if that would affect the mood in the camp ahead of the third-place game, Amadeu said: “It’s natural to be sad after losing the match like this. What happens after this depends on the players’ reaction.